The credit/income opportunities category has grown over ₹1 trillion and is one of the fastest growing segments in the debt category. Currently, credit theme is prevailing over duration due to uncertainty over further policy rate cuts amid rising inflation. The category has seen a good degree of upgrades and credit spread compression over the years. HFCs/NBFCs, which form a major part of the portfolio, have seen upgradation by multiple notches over the years. The challenge is the risk not being adequately compensated amid ease in the availability of liquidity. Since credit portfolio does not have a high turnover ratio, hence most of the portfolio gains, over and above the portfolio yield, could remain unrealized. Moreover, credit rating migration will be limited as SEBI has tightened the norms for rating agencies. Any negative news on the sector or company may lead to downgrades. The credit opportunities fund is an accrual fund. Hence, most of the portfolio gains will come from portfolio yield. Mark-to-market gains from here on could be limited. So, the way forward for such funds is to ensure addition towards right issuers. Therefore credit penetration within lower category issuers stands limited for mutual funds; hence MFs will continue to identify newer issuers/sectors. Short-term to medium-term credit funds fall within the category where the duration of funds vary from 1.5 years to 4.5 years. As the interest rate cycle has been favorable, longer-duration credit funds have performed better than short-duration credit funds. Hence, UTI Medium Term fund (medium-term credit product) will give higher returns than UTI Income Opportunities fund (short-term credit product). UTI Income Opportunities fund has a good performance history in the short-term credit category, in terms of risk adjusted return — which means that for the underlying risk that is taken, the returns are superior within the category of funds. Banks have been helping corporates to reduce their cost of borrowing by tapping into wholesale markets. The excess liquidity that banks were left with, post demonetization further skewed the corporate bond spreads as bond demand far exceeded supply. The flow of FPI into domestic bonds since March ’17 has supported the corporate bond spreads. 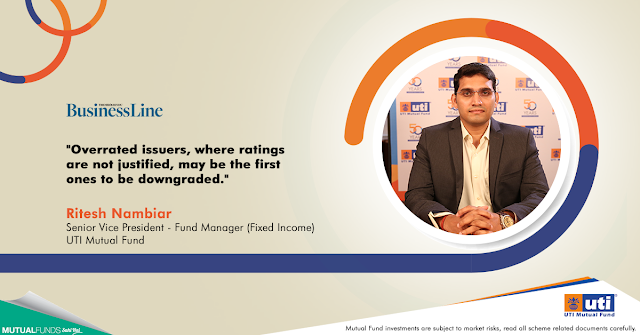 Steady demand from mutual funds/insurance month after month also helped in reducing credit spreads across ratings. Globally, there is an issue which advanced countries are not able to re-inflate, keeping central banks tentative about their rate actions. In India, thanks to the sharp fall in food inflation, the overall trend in consumer inflation has been favorable. But, just like RBI, UTI believes that this could normalize inflation head over 4 per cent by March ’18 and the room for further rate cuts could be limited. Thus, the fixed income market from here on is much more data-dependent.